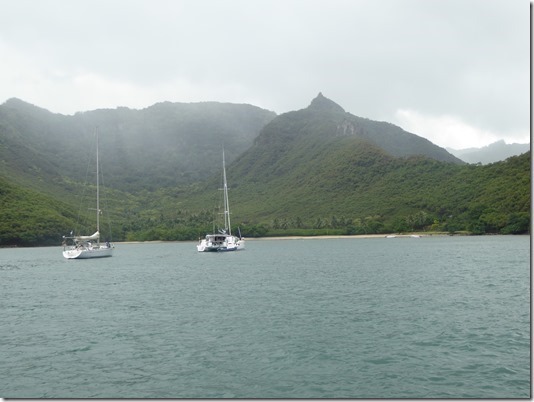 We moved around to Hakatea Bay (aka Daniel’s Bay), about 5miles W of Taiohae. 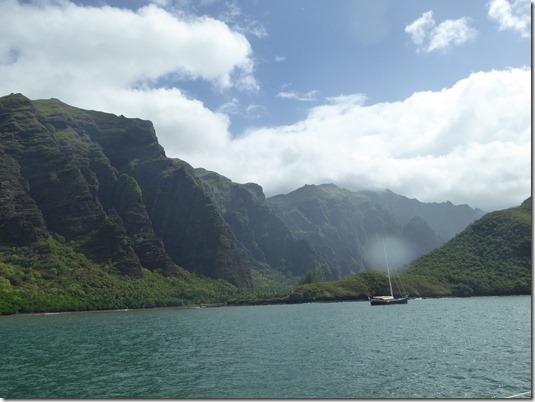 We chose an hour of squalls and bumpy seas to move between bays. 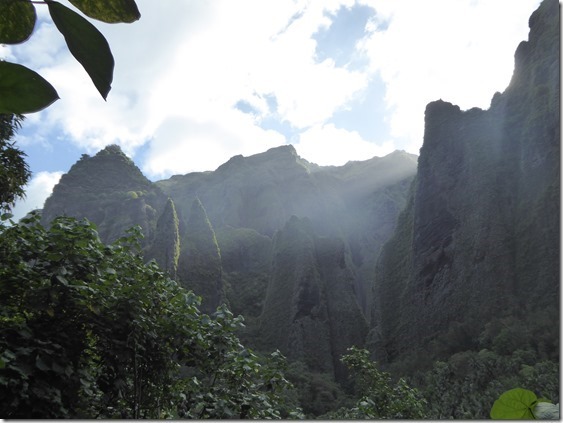 It is an extraordinary entrance with 800’ cliffs running N-S as you enter. You feel as if you are driving into the cliff, before turning hard right at the last second through the narrow entrance into the shelter of the bay. The bay is in two parts. The western finger has a river running in to it and is very brown due to the runoff with all the rain we are having. 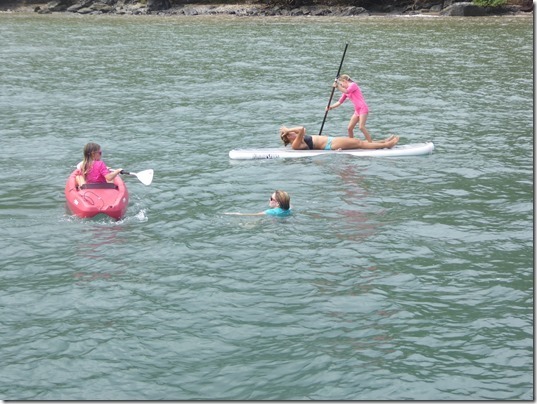 We anchored in the eastern arm in 30’ of flat water and then had fun with the paddleboard and kayak. I’m on 4 days no salt water because of the new tattoo so got photo duties. 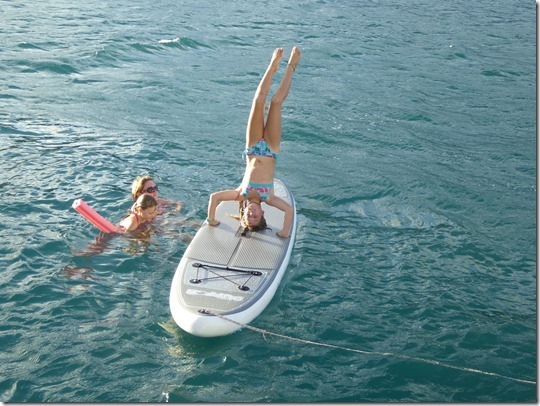 Try doing handstands on a moving paddle board in the surf. Well done, Eleanor! We did get some visitors too. 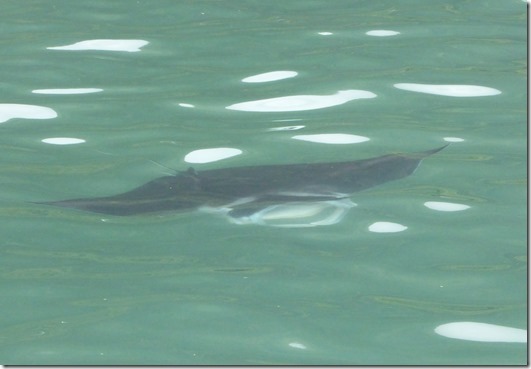 Baby Manta Rays – about 5-6’ across feed in the bay. 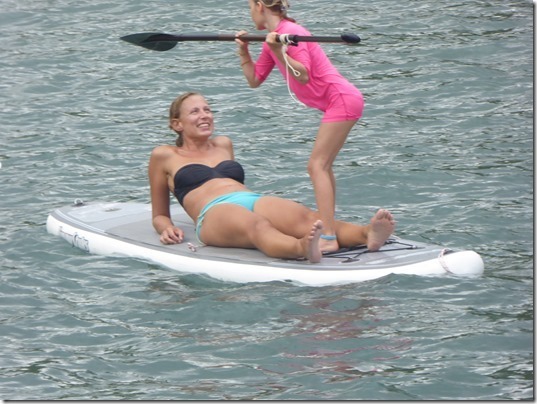 We decided to stay in the kayak to photo them after Mia noticed a large Black tip Shark just underneath her. With all the earth rolling down into the bay after more torrential rain last night, visibility isn’t good, about 3m, so it got pretty close. The sharks are in to breed and there are plenty of their prodigy around. We even caught one on the rod which we quickly released. 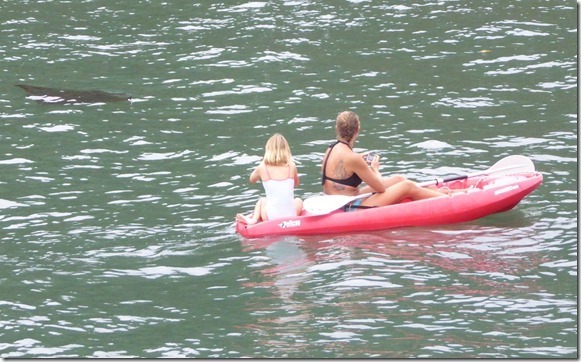 We know from another boat there are Hammerheads in too but we haven’t seen them yet. 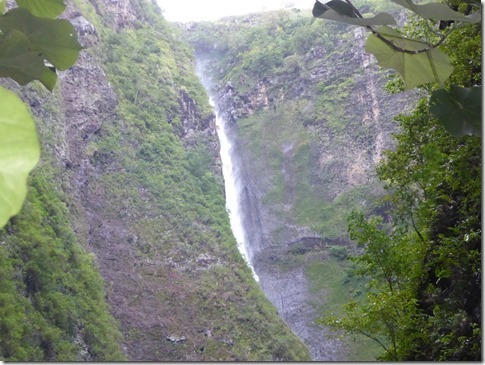 The main reason for visiting Daniel’s Bay is the walk up the valley, following the river to the high waterfall. The walk is an easy one, a bit muddy at times, but I’d suggest you wear long sleeves and trousers as there are plenty of bugs along the route. 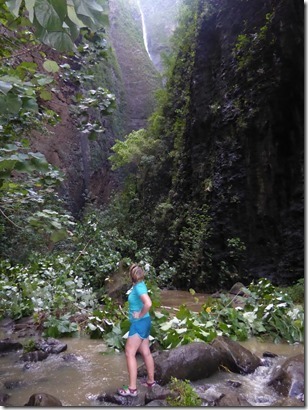 You will be wading as well so make sure your shoes are waterproof too. It takes about 6 hours there and back. 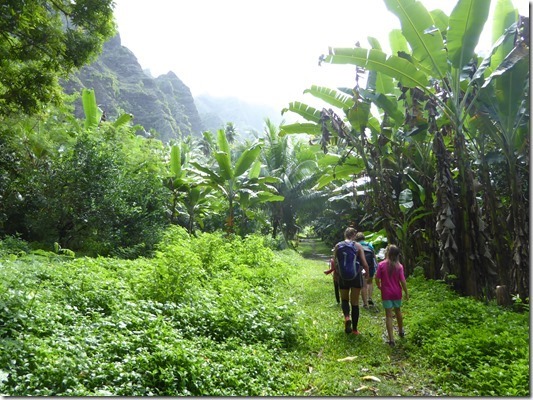 The first part of the walk goes through the local’s back gardens and fruit trees. So bountiful. You can ask the locals here for fruit and they will arrange basket loads. You get a huge amount for not a lot. 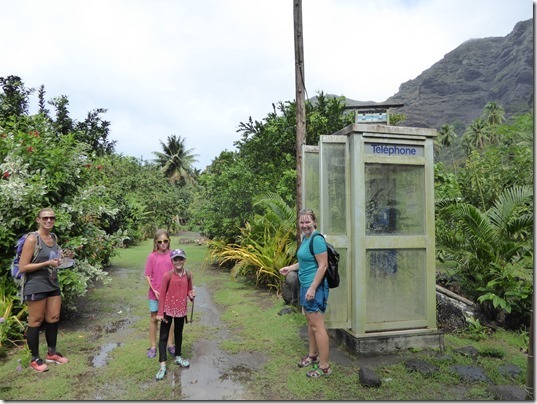 We were also surprised to find a solar powered telephone box in the midst of paradise! Hannah was happy. 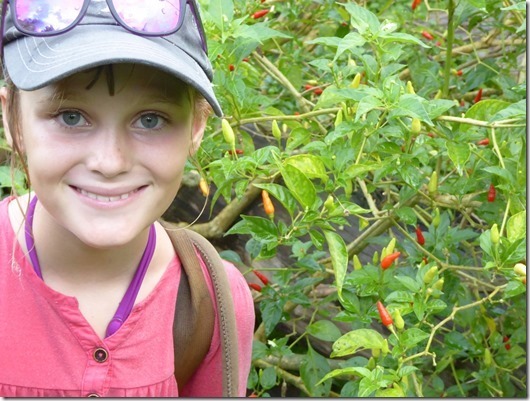 She found a chilli bush. A new collection of birds eye type chillis for the pot. 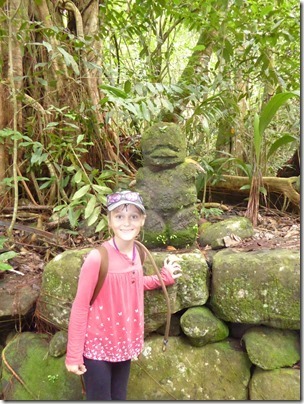 And we found the odd tiki as well. 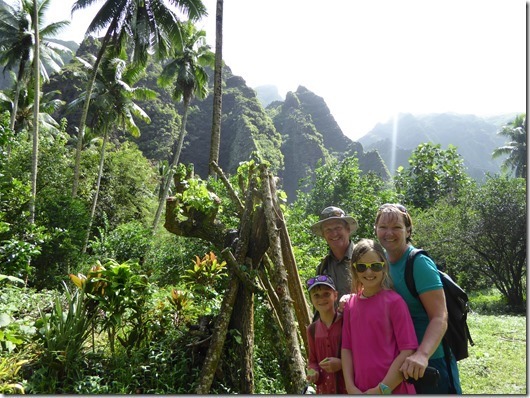 All along the bottom of the valley you will find remains of traditional houses with their house tiki standing as guardian. 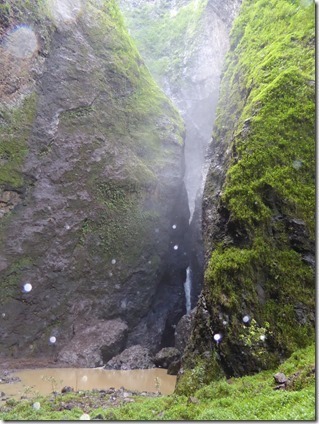 As we broke into a small clearing from the near continual canopy, we got our first view of the waterfall. 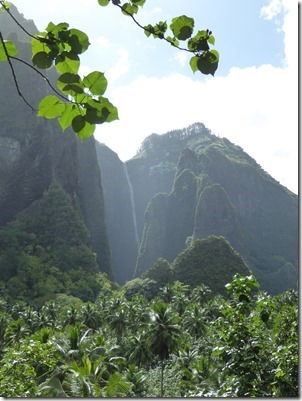 It is the highest waterfall in French Polynesia and falls a little over 1000’. We could hear it rumbling from a couple of miles away. Once we got close to the falls, we had the river to deal with. Lou, of course, tried to fall in but recovered for the photo shoot opportunity. 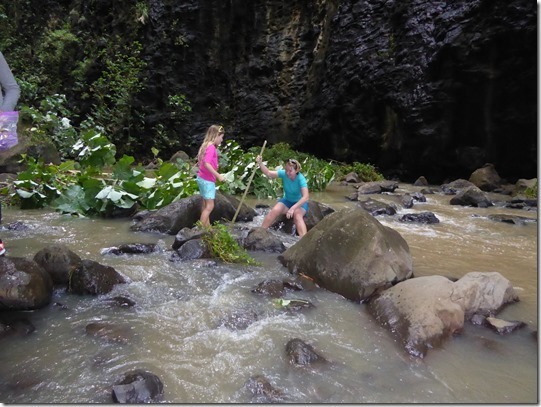 Watch out for the fresh water eels as you cross and recross the river as you get near to the foot of the waterfall. The eel we saw was more than 5’ long! 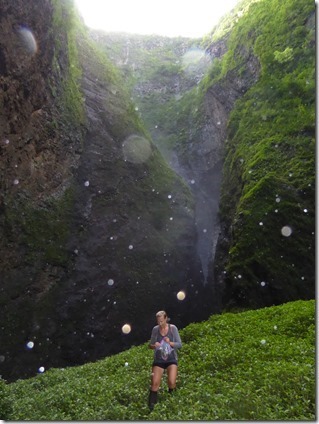 Mia and I decided to brave the “instantaneous death” from falling rocks threatened by Terry, an emotive soul, bless him, and one of the tour guides we had met on route, if we tried to get up to the pool at the bottom of the waterfall. It was worth the extra 200m. The number of craters made by falling rocks a little worrying but we kept a good look out and didn’t stay long. Having taken our time and enjoyed the views on the way up, the walk back down was done at a fair pace to ensure we didn’t end up in grey/green territory. The evening sunshine, the few times we did break out of the canopy, gave us some wonderful light effects.